Do you remember when you could only eat fruit that was in season? California green grapes in the summer--plums and peaches only when ripened on the tree--not by tanks of some kind of lethal gas and let's not even go down the strawberry path let alone the tomato. And bing cherries? They were only available for a few weeks in the summer. I have a theory. People who love antiques also fondly remember the seasonal fruit days and would welcome them back in a heartbeat. Antiquers have an appreciation for the past and history and a slower time when we could savor life more. Not hurry through it to the next thing. I have found this generation's seasonal fruit to slow down and savor--blood oranges. I came on to them years ago while living in England--in the incarnation of blood orange marmalade. I contend that any marmalade purchased in England tastes better than that purchased elsewhere. Blood orange marmalade is the color of a sunset and when made by a small batch kitchen or purchased from a stall at an English country church or jumble sale--all the better. Dear Husbola and I stayed at at a swank townhouse hotel in London years ago--and a dense chocolate cake was accompanied by a dollop of yorkshire made blood orange marmalade. Incredible flavor combination. 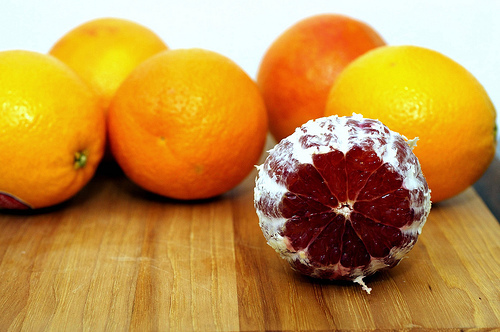 How can you not be intrigued by the flavor of a fruit that looks like this? They are only available in northern Illinois in January. I haven't a clue where they come from. Yes--they increase my nasty footprint on the earth because I am not eating only local fruit. But try one--you will be hooked. This time of year makes me smile--especially when I am standing in the grocery line reading the covers of the latest magazines. Every magazine in January/February has ideas for losing weight, redoing your house on the cheap and generally for making fresh starts. Dear Husbola and I have just completed a room and porch renovation that took longer than the building of the pyramids of Egypt. Happy with the results, we are combing our home looking for items to use in the new spaces and generally trying to get the house to feel like our own again. I am trying to think creatively--an antique desk that was in our bedroom is now in the garden room. A piece of artwork that was in the guest bathroom in now having a fresh start in there as well. But in amongst all the rooting around closets and cupboards--I am finding an awful lot of dreck. Stuff that we have not touched in years, and in some cases do not like or want anymore. Let's not talk about the outdated shoes or that skirt that hits me at the "bad place to hit a 53 year old leg" place. Some of this stuff just has to go. So--I made up a rule for 2013. I did not have to buy a magazine or watch HGTV to come up with this one. For the entire year--every day--five things have to be sorted and either thrown away, given away, put in our shop to sell or repurposed in some manner. That's right--FIVE things. And old magazines do not count. But what does count? Expired bottles of herbs or spices--old underwear that could be cut up for rags--books that will never be read again--VHS tapes of favorite movies but the tape has become too dark for good viewing--tupperware--anything that hits me above the knee-stacks of recipes that I can find again on the internet-you get my drift. Yesterday I went through 5 drawers and cupboards in our kitchen. The newly organized space is SO great. Makes me smile. Even Dear Husbola is buying into this. He is reorganizing his desk and a bookshelf--the desk will become workable again and his unusual assortment of memorabilia and treasure is now visible on the shelves. Looks good. Antiquer's homes can be cluttered and way too stuffed. We fill our space with things we love and things we paid too much for and cannot sell--and we are just accumulators. I am sticking with the "Get Rid of Five" rule. No backsliding--I promise. While enjoying unseasonably warm January temperatures here in the upper midwest--I should be taking full advantage and tackling the garage. We have a big show coming up in February--the Northern Illinois Antique Dealers Association show near Rockford on February 15-16. I have loads of inventory that needs to be processed-and I need to plan the booth look and other details. But--instead I made soup. Not just any soup-- A delicious barley vegetable soup that moves from my unsorted pile of recipes to the vaunted designation of "Keeper". I don't know the origin of this recipe--and would give full attribution if I knew. I just know that the combination of spices and veggies and barley makes a particularly piquant soup. Today I will have a cup for lunch. Then I will tackle the garage. I promise. I chopped all the veggies in my food processor. Put everything in a big pot. Simmered for 90 minutes. Total yum. There comes a time when you just have to make changes. Change is good. Midwinter is a good time for antique dealers to take stock of their stock. We have completed a room renovation at our house--and the garage has been the storage for everything that "belongs someplace else but can't be there right now." I thought of posting a picture--but then thought better of it. If you saw the garage--you would be sending our name in to one of those pathetic hoarder shows. Really you would. I have taken stock of our stock. Our inventory right now has many looks. Too many looks. I run around alot. We are in three retail shops--and none of them is close to home. The closest is 1.25 hours away and the farthest is 2.5 hours away. Working at keeping stock fresh, filling holes and just general moving merchandise around the booths takes a great deal of time. For the most part--I enjoy that work. Anymore--not so much. It is not an age thing--or an interest thing--or a money thing. It is a focus thing. Each of the shops we are in has a different clientele and takes different merchandise. As we are out buying--we always ask "Is this a Walworth thing or a Delavan thing or a Madison/Odana thing?" So--while you just may have read of our excitement last summer at opening a large booth in Delavan--we are shutting that space down at the end of this month. Transitions are sad--and the shop is a friendly, easy going place in a charming well traveled downtown. But we need to fine tune our focus. While Dear Husbola preaches correctly about diversification in other areas of our life--we will be fine tuning and focusing our buying for the remaining two shops and shows. Change is good--change causes us to evaluate what works and what doesn't. Three shops does not work for us anymore. One thing I am sure of--our customers will be the winners. And the garage will have a fresh look too. As the New Year starts--Dear Husbola and I begin to muse where our business will take us this year. One thing is sure-- People need to eat--they do not need another "sweet little painting for the powder room" so 2013 will prove to be another challenging year for selling. I page through magazines (the ones made out of paper--how vintage!) to look for design ideas. Do people want color--or is the belgian brown and cream still in? Does chippy, weathered furniture excite people--or are we back to "the browns"? Color--what color? Retro color or harvest gold or avocado? Or true red? Pink like Grandma's 1960s lipstick? Greens--are greens back? The trends are what the particular magazine say they are. Country Living says one thing--Veranda says another. My British design magazines say yet another. Southern Living yet another. I have learned that for as many magazines as there are--the trends number the same. What are women in their 20s looking at? Or women in their 40's? Are buyers really that trendy? I don't think so. It is expensive to paint a room or buy furniture. We learned many years ago to keep the bones of our house neutral and then give change and pop in your rooms with accessories. We are fortunate that the antiques business keeps us out and about all the time-we can constantly swap one thing and one thing then can go for sale. It has kept our house fresh all these years. Cluttered--but fresh. One thing is for sure. I don't think the shoppers under age 40 in our midwest market are looking for "antique" any longer. Further, the collectible widgets of 20 years ago are dead. People want fairly priced items that they will live with "for awhile". Not investment pieces. They buy what they like--and whether it is a fine antique is not so important. As a dealer-I could make myself crazy figuring out what people want in 2013. Our plan? To continue to buy interesting items that "pop" at us. And hopefully they will pop at one of our buyers. So--buy what you like--don't follow the elusive "trends" and enjoy your finds.